This month's challenge was to make Brunswick Stew (either using a slow method or a faster method). Verdict - The final stew is very tasty and light and with the addition of lemon juice and vinegar at the end really gives a nice tang to the dish. The recipe yields a large quantity so be prepared to freeze or make leftovers, even a half batch is a lot! I did the long version number one. I wasn't expecting such a flavoursome stew it really is one of the best tasting stews I've made - it is not too heavy it remains me of autumnal evenings for some reason. I had chicken stock on hand from the last challenge. Some of the veggies - I used turnips since they were on special and I love them, notice the Chinese sausage (I used in place of the bacon slab) which I left in the stew no use wasting it. I used double peeled board beans since they were to hand and were top quality. Also I added the traditional Australian addition of vegemite (4 tablespoons for a double batch) to the stock as any Aussie knows it adds a lot of yum to any stew. Also I fried the onions I don't like using raw onions in stew they always taste raw even after cooking for many hours to my tastebuds. I added some roasted garlic also I some to hand. I did a double batch enough for twenty people they will be due very soon about an hour from now. So I used my HUGE slow cooker it holds about 30 litres. I was wondering what I was going to make thank goodness the challenge was easy to scale up to a large number. As Wolf mentioned the stew about half way through will look yellow and mine really does! After cooking everything I tested the stew I placed some in a small pot to test. The spoon really does stand up!! Final stew it was delicious unlike anything I have made, it is so fresh tasting, initially you taste a combination of the meat and veggies together at once which is so pleasant and when you eat it you get a flavour array from all the different ingredients. I added lotus root and garlic chives in the last 10 mins to add some visual interest and freshness since I had them to hand. I really think using the Chinese sausage added a great depth of flavour to the stew and the fresh chives really lifted the final dish to a new height. 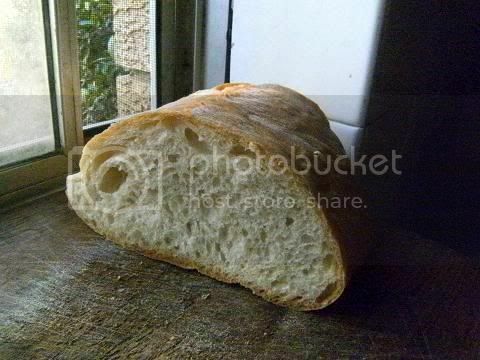 I baked some of my favourite bread (pane di casa) to have with the stew. I made six loaves. See recipe below. Pictures of the final dish I served to twenty people. I added some Chinese greens at the end and some fried tomato paste with lots of smoked paprika which really added that extra visual and taste punch to this superbly delicious stew. I'm so impressed with this stew it is so light yet hearty and it has a lovely mild sweet/sour characteristic to it that is enchanting. The average score from twenty people was 9.25!!! High praise from a group of foodies. I think the crisp toasted bread didn't hurt too much. 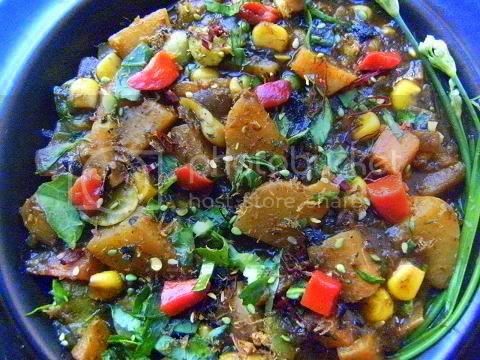 The final stew is so colourful and has so much flavour. 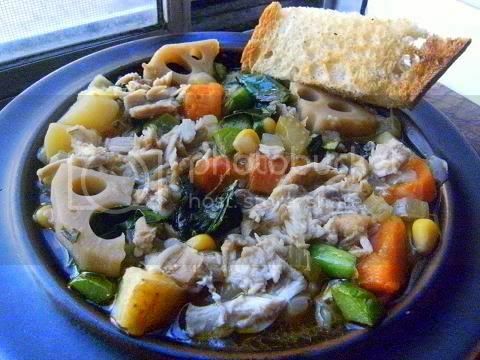 Four people guessed that there was crocodile in it so I would say that it was present as a distinct flavour, the individual components could be tasted which is one thing I liked about this stew and the stock was a great melding of the different ingredients. Crocodile is easy to prepare and cook. It is best cooked from frozen as during the thawing process most of the moisture runs out decreasing the flavour. It should be cooked for two minutes on either side and then allowed to stand for a few minutes. It is best served just cooked (in red meat terms, medium rare). Remove excess fat after cooking. If frying, always use butter or olive oil as they will not impart a flavour that is unique. Do not use margarine as the hydrogenated fats can emit an unpleasant flavour and prevent you from using other dairy products such as cream in the recipe. Crocodile tastes like a very meaty chicken with a hint of fish to it which is very nice in this dish it adds a lot of complexity to the dish. What to do with leftover Brunswick stew? Make a simple brown butter roux (equal amounts butter and flour pan fried until brown) add to the stew this will thicken it to the consistence of a pie filling. 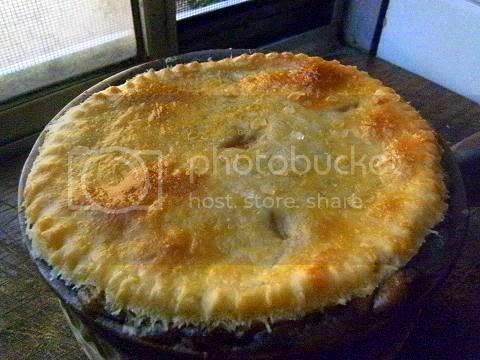 You can make individual pot pies as I did or a large pie. I used a simple pie crust (2 parts flour:1 part cold butter and the minimum amount of cold water to combine all the ingredients) with an egg yolk wash on top with some rock salt crystals. Hollow out a good quality sourdough bread roll fill with the heated thickened (as above) stew add cheese, chopped chives and toasted minced garlic, grill (broil) until cheese is bubbling and melted. I thought I would make a vegetarian version. Firstly I started with the stock. 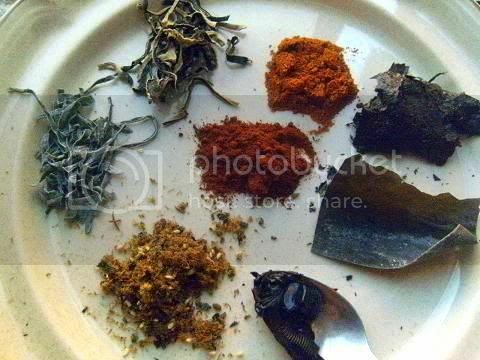 The ingredients are starting with the red powder on the top going clockwise. Smoked chilli powder, soup seaweed, kombu, vegemite, powdered shiitake mushrooms and seaweed with sesame seeds, shredded smoked dried seaweed, shredded cloud mushrooms and in the centre smoked paprika. 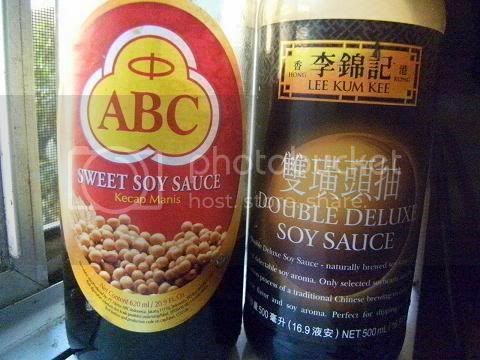 And below are sweet soya sauce and mushroom soya sauce. 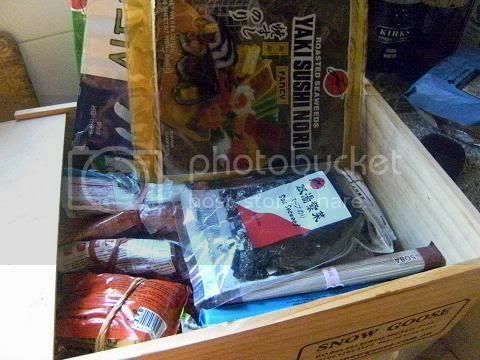 I have a special box full of umami ingredients and sushi ingredients. I made the vegetarian stock (the batch on the left) separately it was very strong in meaty goodness. 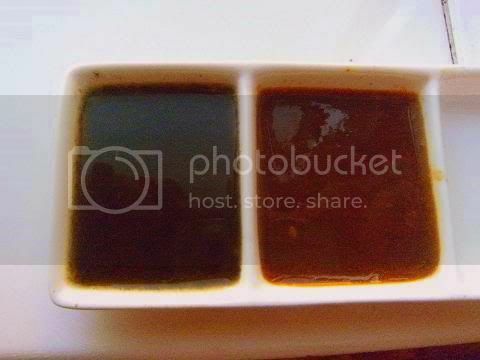 The appearance of the stock just after I added it to the other ingredients (the batch on the right it is much redder). And the colour of the final stew liquid after simmering it is much browner with a tinge of yellow. Add all the stock ingredients (except the powdered shiitake mushrooms, smoked chilli and the smoked paprika) into a stock pot simmer for 2 hours then purée with a hand blender until smooth. 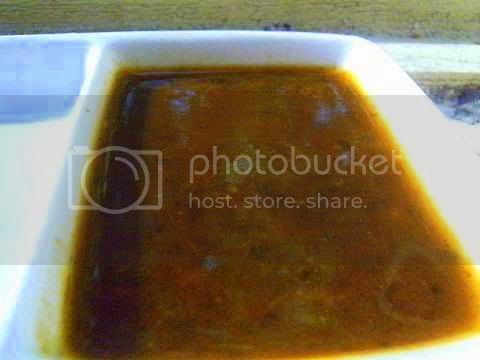 The various ingredients absorb a lot of water and after blending the stock is thick and a very dark colour see above. To make the stew fry the onions and when softened add the smoked chilli, powdered shiitake mushrooms and the paprika and semi-dried tomato pesto and fry until the oil changes colour to red. The smell is amazing at this stage, then add the other root veggies and fry until softened and you can smell the odour of the sweetness coming from the veggies. Then add the vegetarian stock and simmer for about 2 hours. The final stew had a wonderful colour which the root veggies absorbed and it had a strong savoury meaty taste with a umami zest at the end. And no it doesn't taste of seaweed or mushroom. But did it taste like the first Brunswick no! 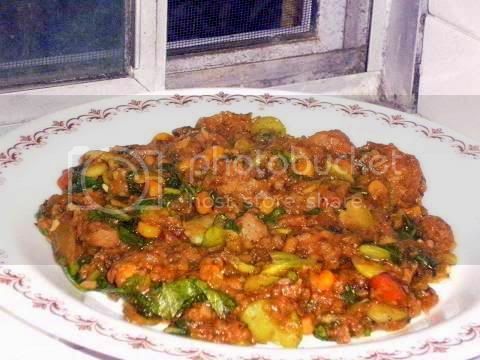 it tasted like if I had used beef and chicken it had a more robust flavour and also the stew was much thicker overall, a much heartier stew with a strong savoury taste. I garnished with chopped Chinese greens, toasted wasabi sesame seeds, chive flowers, roasted red capsicum (bell peppers) and powdered shittake mushrooms. It looked very colourful and so so delicious. I just finished the stew (an early dinner) with three others friends - well they all thought I had made an excellent beef stew they really liked it a lot, one even thought I had use wagyu beef, well I'm disappointed a bit, I wanted to make a vegetarian stew with a nice light chicken/crocodile meat flavour like the last one. Back to the drawing board. Will have to experiment a bit with the stock to lighten it to a roast chicken flavour and not beef. 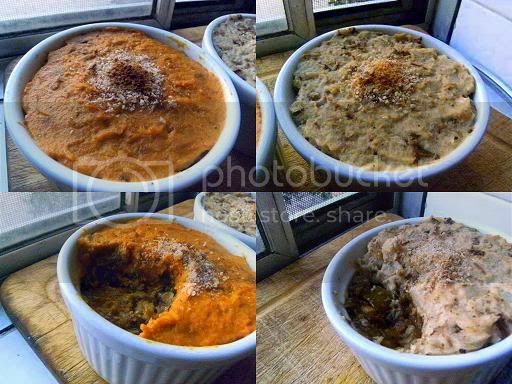 Place leftover stew into individual pie pots and top with your favourite roasted mashed veggie (add a little cream (or cheese) to the mash and season well). 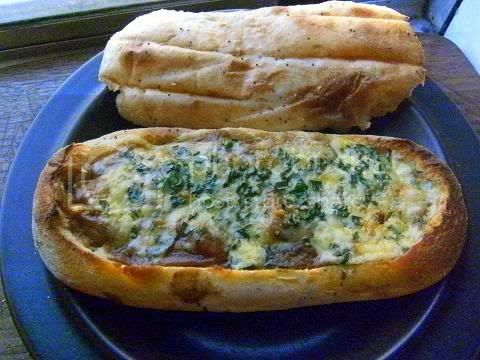 Then bake until topping starts to brown you can add breadcrumbs and cheese if your wish. I used mashed roasted carrots and mashed roasted turnips (yum yum) this is my favourite way so far of using the leftovers with the submarines a close second. These cottage pies left me in a blissful comfort stupor for a few hours there is something about the contrast between the mash and the stew that is amazing. As you can see the leftover vegetarian stew went very thick and a very dark colour overnight. 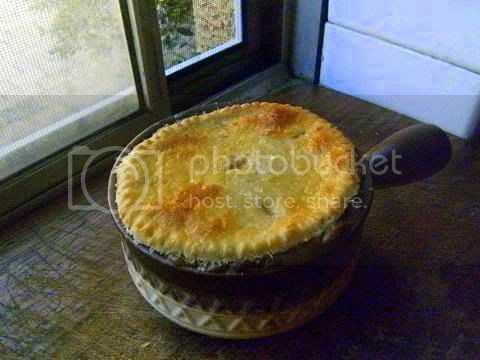 I think this would a great way to serve the stew in the first case it is such a lovely dish yum yum. Next time I will be doing split pea mash and roasted garlic mash they would go so well with the stew. A couple of mates came over luckily I started making bread stew the night before. Lots for cultures have the tradition of adding bread to leftovers to make a new meal. 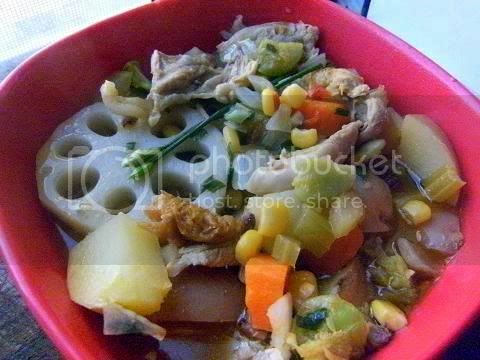 This recipe is based on what my mum did when we had leftover stew. This was my father's favourite meal we used week-old Finnish black rye bread I love it also I make it a few times a month. The night before chop a good sourdough (or dark rye bread which adds an extra layer of flavour) loaf into cubes add to the stew, add extra chopped greens (like spinach) just before heating. Slowly heat until the greens soften and the stew is hot. Check for seasoning you will most likely need to adjust I added extra soy sauce and some extra fried tomato paste and a lot of pepper. If you look above notice the vegetarian stew I made yesterday and the difference after adding the bread cubes overnight and heating gently it looks exactly like beef stew and tasted like that too. The colour and taste deepened a lot overnight also. The texture of the resulting stew is very different to the normal vegetarian Brunswick stew the bread takes on the texture of beef! I think it has got to do with using powdered seaweed and powdered mushroom I guess these gelled (solidified) in the bread to form the correct texture. I'm very impressed with this stew I'll have to experiment and see if I can reproduce the reaction again. I'll post the full recipe on my blog. Sorry for the photo it is night here and had to use the flash. 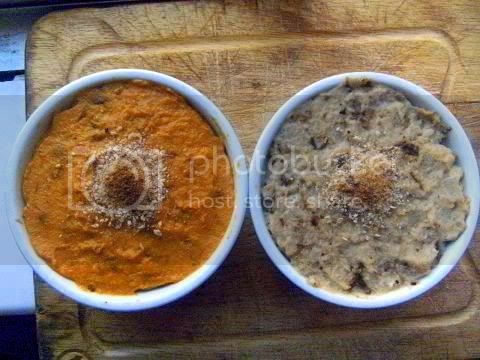 Note about the type of bread to use -- use old stale bread and the denser the better (dark rye, German black bread and day-old sourdough are all good) do NOT use soft white bread like Wonder soft you will end up with an unpleasant mush instead of bread stew. 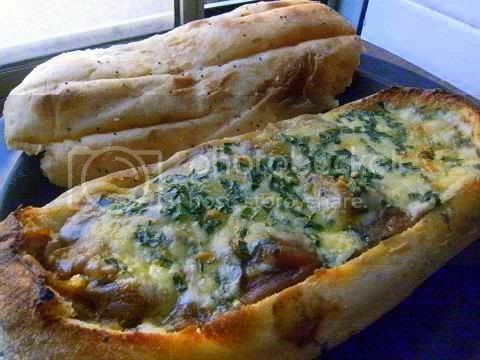 The bread should hold its shape and have some texture when prepared in the stew. Mandatory- You must use one of the two recipes provided. Now, to not exclude our vegans/vegetarians, if you’d like, use vegetable stock and leave out the meats. It won’t be a ‘true’ Brunswick Stew, but it’ll have the spirit of one.) There’s no gluten anywhere in this that I’m aware of, so we’re good in that regard. Removing the chicken, shows how tender it has become, as it falls apart upon being lifted from the pan. Shredded and deboned pork and chicken, with a piece of bacon. Ready to go back into the pot. Finished stew. This was made using the Lee Bros. recipe. The Callaway Ruritan Club recipe will be redder from the tomato juice. 1.I always preheat the insert of the slow cooker first just use hot water from the kettle this really speeds up the cooking process a lot. 2.Always heat up the veggies and meat first before adding to the insert again this really speeds up the cooking process. 3.Always sear/brown your meat it improves the flavour and again speeds the final cooking process. 4.Condensation will form in the lid. To avoid dripping the condensation onto the food, always lift the lid gently, straight up, without tilting it, until it is away from the insert. 5.Because there is no evaporation during cooking, there may be excess liquid in the insert at the end of the cooking time. If so, drain it into in a small saucepan and simmer until it has reduced to an appropriate amount. It's important to add seasonings after this reduction takes place, since reducing the liquid will intensify the taste. 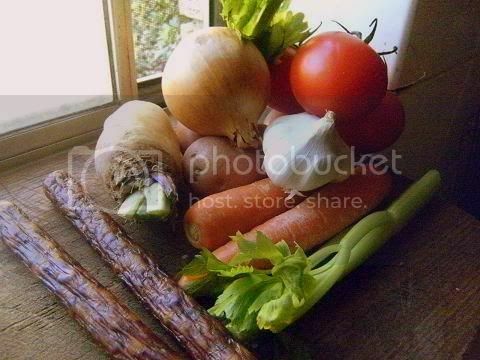 6.Vegetables do not cook as quickly as meat, so they should be placed in the bottom of the appliance. 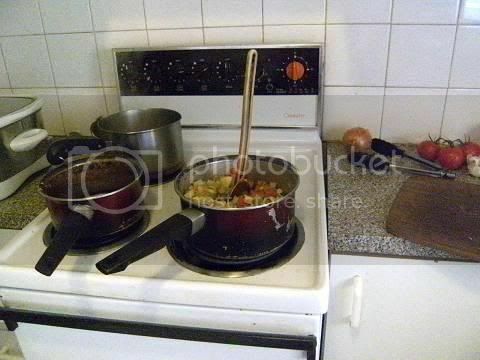 7.Don't lift the lid to stir, especially if you are cooking on the low setting. Each time you lift the lid, enough heat will escape that the cooking time should be extended by 20 minutes to half an hour. To check progress without lifting the lid, spin the cover until the condensation falls off. Then it's easy to see inside. 8.Cayenne pepper and tabasco sauce tend to become bitter if cooked for long periods of time. Use small amounts and add toward the end of the cooking time. 9.Stir in spices for the last hour of cooking. They will lose flavour if cooked with the rest of the ingredients for the long cooking period. 10.Liquids do not boil away in the slow cooker, so if you are making a recipe that wasn't specifically developed for the slow cooker, reduce the liquid by 1/3 to 1/2 unless you are cooking rice or making soup. 11.Dairy products should be added during the last 30 minutes of cooking time, unless the recipes states otherwise. 12.Add tender vegetables like tomatoes, mushrooms and zucchini during the last 45 minutes of cooking time so they don't overcook. 13.Only fill the slow cooker one half to two thirds full. 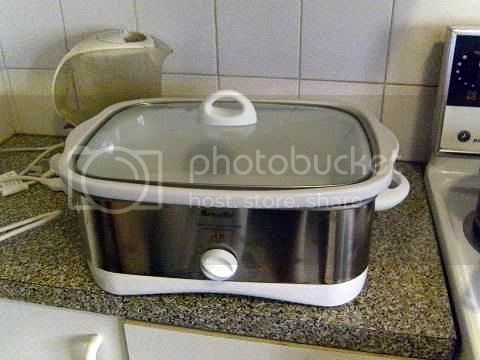 The foods will not cook properly if the appliance is filled to the brim. 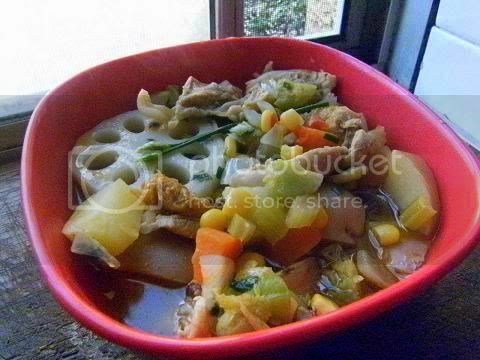 If the food and liquid level is lower, the foods will cook too quickly. 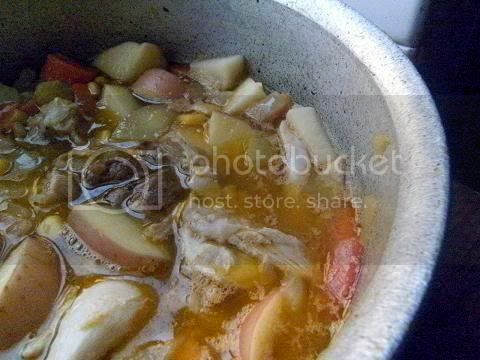 14.Fresh root vegetables, such as potatoes, carrots, and onions, should be placed in the bottom of the pot, under the meat, for faster cooking. They tend to cook more slowly than meat. I usually par-boil them a while to speed up the cooking process. 1.The food must be in the fridge or freezer within 2 hours of it being cooked. One hour if the weather is hot. 2.Make sure your fridge is at or below 40F (4.5C). 3.The food should be stored in shallow wide containers less than 5cm (2”) which speeds up chilling times. Do not stack the containers on top of each other. 4.Chill the food down as rapidly as possible to 40F (4.5C) to discourage any type of bacterial growth. Modern fridges are designed to handle leftovers so don't be concerned about putting hot food into the fridge. 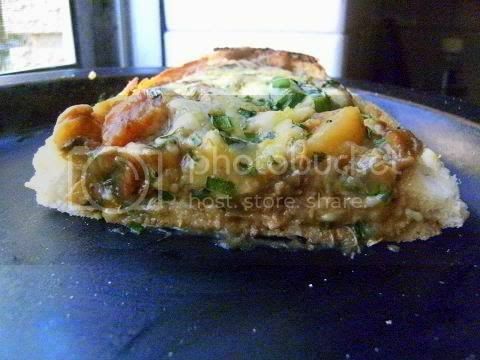 5.Generally use leftovers within 4 days. For gravies and stuffing use within 2 days. Rice use the next day then throw out. 6.Remove the stuffing from cooked poultry and refrigerate or freeze it separately. 7.Use glass or food-grade plastic containers. Do not use a bowl with normal plastic wrap which allows air movement which encourages bacterial growth. 8. Use containers that are about the same size as the food this retards bacterial growth because there is less oxygen for the germs to grow. 9.Make sure all the containers and your hands are clean before storing and handling food. 10.Always thaw frozen foods in the fridge NOT on the counter or in warm water! 11.Freshly prepared hot dishes can be kept warm in the oven provided the internal temperature stays at least 140 degrees F (60C). 12.Leftovers should be reheated to at least 165F (74C) before consuming. 13.Label and date your leftovers. I went to your blog and I noticed that you have done the entire BBA (Bread Baker's Apprentice) challenges so you are a very experienced bread baker so the instructions will be short though I'm sure you will understand. I love the breads you have made they are top notch. A Pane di Casa Loaf is a traditional Italian bread made by resting the dough for 12 hours (or more) to give the bread an extra chewy texture & deliciously crunchy crust. I go by volumes usually with bread (the conversion is 1 cup of flour is 150 grams and 1 cup of water is 250 grams) since the water is always approximate anyway, and I go by feel. Think of it as a ½ Levain and ½ Ciabatta bread. Mix the sponge ingredients together and leave for 12+ hours in a warm place. I usually do it the night before and don't worry I have left it for 20 hrs and have had no problems. The next day roughly add in the 3 cups of flour autolyse up to three hours (min of 30 mins depends on how busy I am). Add in the salt knead for 8 mins until it's smooth and elastic it is a sticky slightly wet dough. Let the dough rise. Fold (every hour) until it has doubled in volume (about 3 hrs) as described in BAA shape into two long loaves let the loaves rise again. Slash with one cut along the length of the loaf. Preheated 230C oven for about 45 mins with a pan of steaming water in oven for the first 8 mins. I always have the steam pan with water in the oven while it is preheating that way the oven is full of steam when the bread goes in. I hope this recipe makes sense if not I will expand it for you. Unfortunately I always go by feel and really haven't thought about the recipe much until now. The good thing about this bread is that it keeps so well up to 10 days (after a week use it for toast) I always have a loaf or two on hand at all times. You cease to amaze me! Your posts are so informative and comprehensive, and your variations of all challenges are so creative! Thank you, again, for your support to all the members in our DC and DB groups. You are the man and the Champion Brunswick Stewmaster! CROCODILE! 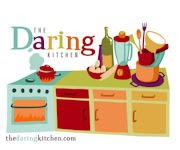 So cool, as are you, for sharing all your talent and incredibly creative Daring Kitchen interpretations. All your versions look so interesting and delicious! Dang, my hats off to you Audax! I so wish i can get inside your head/mind, just to see how you come up w/ all these great/cool ideas. Oh, i mean in the food aspect lol!! As for the crocodile, i haven't tasted one but i'd like to try them. You did a wonderful job once again!!! I think I like the cottage pies the most. After seeing your posts in the forums I almost made a sweet potato topped version. Instead went with drop dumplings. Excellent work and well written as always. I'm jealous of your lotus root, I haven't been able to find it up here and I've been craving a stir fry with it. Thanks for stopping by mine, always makes me feel special. There is SO much to love about yours: Crocodile? Seriously cool! You could do your own show where you're given one recipe and you create enough entries to make an entire restaurant based on it. LOVE IT! Audax, as usual, you're full of adventure and inspiration! I love the addition of lotus root, and making cottage pies? Brilliant! You have done it again! WOW, wow and WOW! You always go above & beyond with the challenges and this time was no exception. 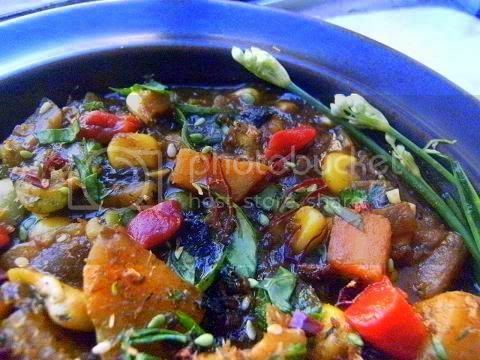 Your stew even manages to look pretty! No fair. Well, full of ideas, as usually :)))))))))))!!!!!!!!!!!! Audax, this is amazing. All these variations! I'm impressed. 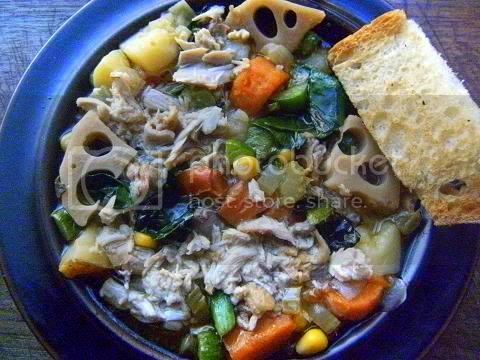 And I LOVE all your ideas for what to make with leftover stew. I have fallen for the Brunswick Submarines. We don't have any leftover because I made only a 1/3 batch, but for the submarines, I am totally going to make the stew again. I thought using rabbit was adventurous but crocodile: wow! And what a lot of amazing ways to cook the stew and use the leftovers, I am tempted to try the pie with some of my own leftovers tonight! Also, love the tip on vegemite in stock. I grew up in South Africa and have always hated the taste of marmite (which is about the same thing I believe). But somehow in a stock it sounds like a really good idea! Thanks. Oh my goodness Audax, you have done it again. Love your version and with croc meat! Wow. I am amazed at what you've conjured up with the leftovers as well. Genius! I love your 'Australian' version of the brunswick stew.. Crocodile & vegemite... wow !! Crocodile meat - wow! Would love to try it!!! 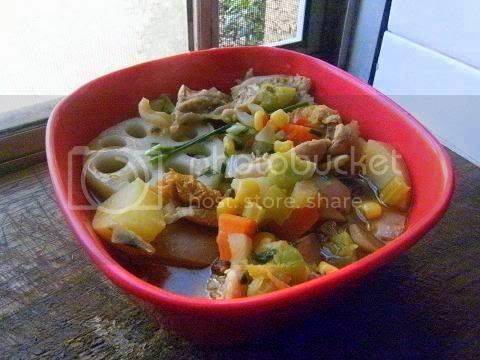 Great that you gave some ideas how to use leftover stew... as the recipe gives you HUGE amount of it! As always great execution of the challenge and lots of good ideas! Cheers (from hot and sunny!!!) Ireland. 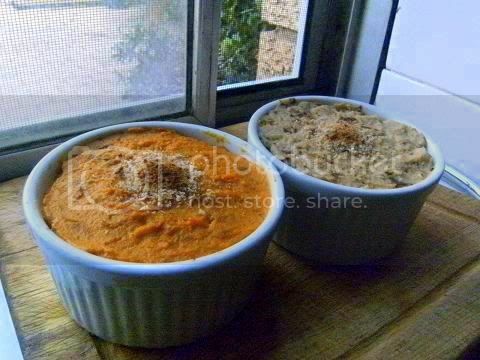 Love the variants on your stew leftovers, especially the mashed carrots and mashed turnip topped cottage pies. Very creative! I don't even know where to startt to comment. Your creativity surprises me every month. I agree a dash of vinegar or lemon juice at the end would be good. Audax, you’re so creative! 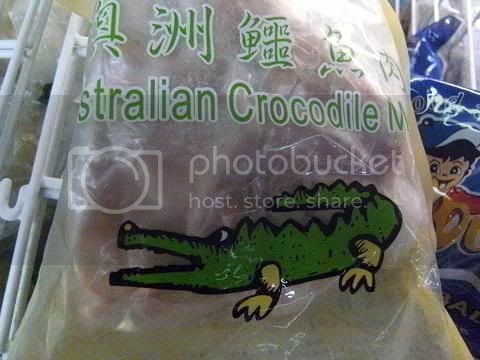 Everything looks so delish, only you could make crocodile look this appetizing. Great job! what a exotic version of this months challenge. adore it. my hubby just took a look at the sub and is now making puppy eyes at me in the hopes that he will get one with the leftovers. greetings from a German that just adores you even if she will not go to get some crocodile. Your versions are amazing in their complexity! Another fantastic job on this challenge. I'm co-hosting the next challenge and can't wait to see what you whip up! I know I've said it before... maybe... but you are amazing! Great job doesn't even cover it! I am awed by the sheer number of creative ways you made the Challenge AND used up the leftovers! Awesome! Congrats, Audax, for another success in putting all of your readers in awe! Thanks for sharing all the possible ways to play with the leftover stew cuz i had TONSSS left. You amaze me. Your creativity, imagination and your zest for food and life are so wonderful! Even being Kosher/vegetarian, I always look forward to seeing what you are going to come up with. And I totally need you to teach me about umami! I love you Brunswick submarines and of course your Brunswick pot pies. I have had alligator when I was in Florida- I really liked it. We just loved this recipe and took your suggestion and made Brunswick Pies with the leftovers......and thanks so much for the idea because it was fantastic! I love your Brunswick stew variations, your pie and sub look so tasty, they're making me hungry!! Great job! Your pictures are so colorful! I love all of your ideas of ways to eat the leftovers. Wow, Audax! You give us and your guests such a fabulous choice! 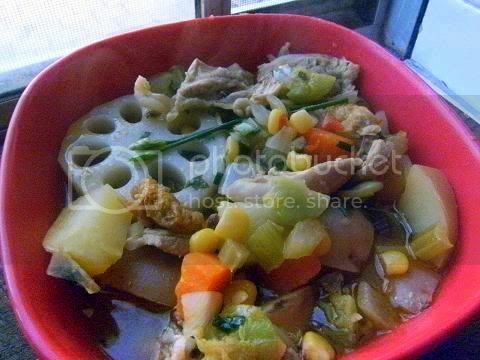 Amazing stew and I love it with the bread crust. Beautiful and tasty. I have been dying to make Brunswick Stew since I was a kid and you've given me all the flavors and choices! I am always impressed with your work. You always give your readers so many variations to recipes so there is never a dull moment in the kitchen. Great job! I wish i could get crocodile overhere, ore could have tasted yours. I'm curious what it would taste like cause i'd never had it. Still have stew in my freezer going to try one of your amazing recipes! Lotus Root looks so cool! I might cut some potatoes similarly someday if I'm feeling a little bit fancy. I really could not eat crocodile_ i am soo scared of them! I think it might be one of the only meats I would refuse to eat. But the stew does look really interesting- I might substitute the crocodile !! Wow! Everytime I'm speechless! Sorry for my late comment on this, been busy lately. 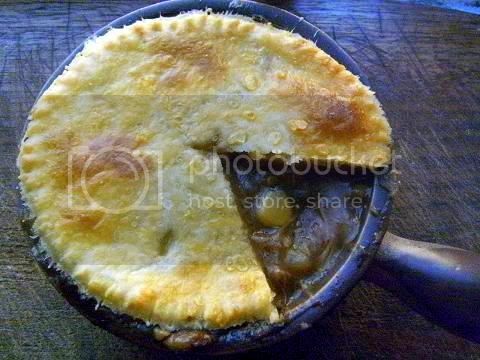 I especially like the pie version of this, I think this work really well with this stew! Wonderful creations! I've never had lotus root before, looks very pretty!